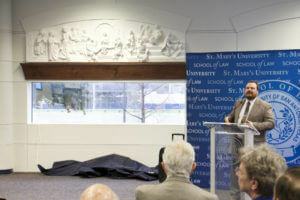 The St. Mary’s University School of Law celebrated the dedication and blessing of the “Christ Among the Doctors” sculpture on Saturday in the Law Commons of the Sarita Kenedy East Law Library. The sculpture by Andrew Wilson Smith is funded by a gift from John and Carole Tanner of Lake Bluff, Illinois. 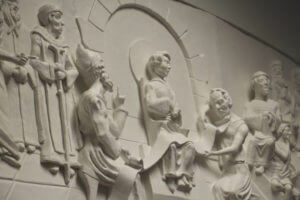 The plaster bas-relief depicts the scene from Luke 2:41 in which a 12-year-old Jesus is found sitting among the teachers in the temple courts of Jerusalem. After the unveiling, Smith discussed the theology and aesthetics of the piece.